[PHILADELPHIA, PENNSYLVANIA—JANUARY 31, 2017]- BLACKSCI-FI.COM and PYROGLYPHICS STUDIO are pleased to announce the release of their upcoming anthology “The Scribes of Nyota”, a compendium of speculative fiction featuring stories, prose and artwork from Black creators. 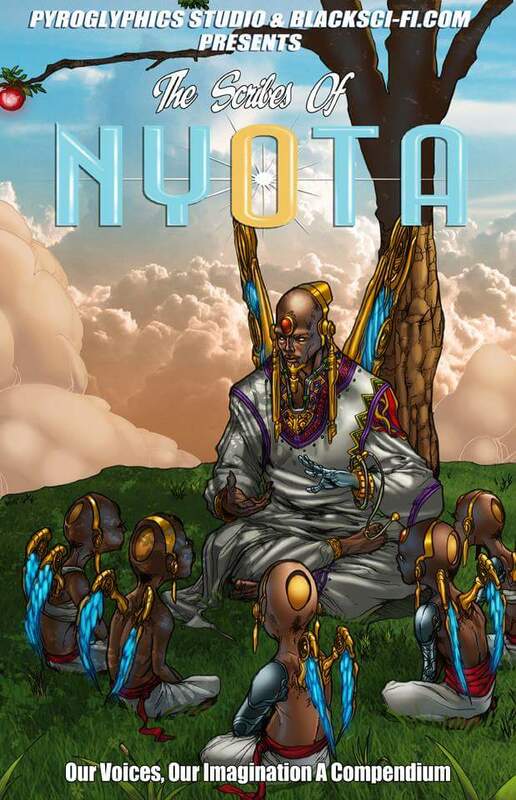 “The inspiration behind “The Scribes of Nyota” stems from inadequate representation of creators of color in the mainstream, specifically within the genre of speculative fiction” said Shawn Alleyne, Founder of PYROGLYPHICS STUDIO. “Because of a lack of inclusiveness in the mainstream, we are building our own platform to highlight the immense talent within our communities. Everybody has the opportunity to dream and speculate who they are, what they want their society to be. Why can’t we—in an unapologetic and unfiltered way?” continued Maurice Waters, Founder and President of BLACKSCI-FI.COM. “The Scribes of Nyota” features a unique blend of new and talented voices within the genre of speculative fiction. Some of the featured contributors to the anthology are M’shai S. Dash, freelance writer and content creator, Robert K. Jeffrey II, writer, Editor in Chief of Black Sci-Fi.com and comic book creator, and Professor William H. Foster, a noted comic book historian. The anthology is composed of a mix of sci-fi and comic book inspired artwork combined with stories and prose that straddle the boundaries of both science fiction and horror. With stories that touch on themes of time travel, feminism, culture and social issues, “The Scribes of Nyota” aims to present stories that own the narratives of Black people and inspires imaginations for generations to come. Founded by Maurice Waters, Black Sci-Fi.com is the premier site for the latest updates on Sci-Fi, Sci-Fact and Fantasy entertainment, news, people, places, and events and the measure of their impact on the African-American community. For more information, visit: blacksci-fi.com. For interview requests and/or advance review copies contact tiara@oakpr.com. Out Now: Nnedi Okorafor’s BINTI: HOME, the sequel to Hugo Award winner BINTI!